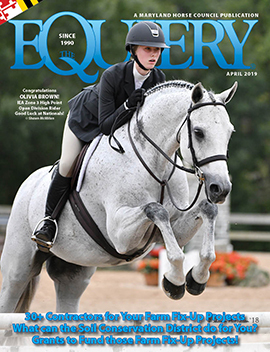 In the July issue of The Equiery, we reported that on June 10, massage therapist Mercedes Clemens filed a lawsuit against the Maryland State Board of Veterinary Medical Examiners (“Vet Board”) and the Maryland Board of Chiropractic Examine (“Chiropractic Board”) for violation of her constitutional rights. Last winter, this Gaithersburg resident received a “cease and desist” letter from the Board of Chiropractic Examiners. A follow-up letter from the Chiropractic Board, reaffirming its position, included a generic notice from the Vet Board. On July 9, the members of the Vet Board issued a statement (see below) apparently saying that it didn’t really mean that non-vets couldn’t do massage, that this is all just a big misunderstanding and that the Board would be happy to talk it over with Ms. Clemens. Is this really just a misunderstanding? In addition to the Vet Board’s July 9 statement, we are including as illustration the original generic memo (see illustration on right). In response to our original article in the July issue, The Equiery has been receiving numerous phone calls and e-mails from therapists and equine health care workers. Some are willing to share their stories with our readers, but others – out of fear that legal action will be taken against them – are not willing to go on record, as they are still practicing, just “off the radar.” We want our readers to form their own opinions on this controversial subject, and so we will endeavor to let our readers, including the chairman of the Vet Board, speak for themselves. As they provide us with their stories, letters and/ or other materials, we will make these available to our readers through both our print and digital publications. Chris H. Runde D.V.M., is chairman of the Maryland State Board of Veterinary Medical Examiners. Annapolis, MD (July 9, 2008) – On June 17, 2008, the Maryland State Board of Veterinary Medical Examiners (“SBVME”) received a copy of the lawsuit filed by Ms. H. Mercedes Clemens against the SBVME and the Maryland Board of Chiropractic Examiners. Ms. Clemens alleges that both the SBVME and the Board of Chiropractic Examiners have, through their regulatory authority, prevented Ms. Clemens from practicing equine massage in Maryland. The SBVME unequivocally has never interfered with Ms. Clemens’ right to practice massage on horses in Maryland and views this lawsuit against the SBVME as premature. The SBVME does not regulate equine massage by nonveterinarians if the massage is intended solely for the purpose of helping the animal relax or generally feel better. The SVBME, however, has indicated in communication with the Chiropractic Board that a person engaging in equine massage may be in violation of the Veterinary Practices Act if the massage services offered are for the purpose of diagnosing and treating a specific ailment or injury of a horse. The SBVME, whose mission is to protect animal health and welfare, has the statutory authority to regulate the “practice of veterinary medicine,” which “includes the practice by any person who … diagnoses, advises, administers [an] … appliance, application or treatment of any nature, for the prevention, cure or relief of a wound, fracture, bodily injury or disease of an animal.”- Agriculture Article, § 2-301(f). If a person engaging in equine massage is “practicing veterinary medicine,” as defined, the person must be a licensed veterinarian. – Agriculture Article § 2-313(1). Ms. Clemens’ lawsuit, however, does not contain a single allegation that she is offering-or advertising- her massage services for the purposes of treating or diagnosing disease or injury of horses. Thus, SBMVE regulatory oversight is not an issue at this time. Unfortunately, the SBVME is not aware of any effort by Ms. Clemens, or her attorneys, to discuss her situation directly with the SBVME. As chairman, I would have been happy to meet with her in an effort to make the SBVME’s position clear and explain to her that she is not prohibited from massaging horses for the purposes she describes in her lawsuit. Will She Drop the Law Suit? Should Mercedes Clemens drop the lawsuit? The Institute of Justice, which is handling the case, immediately responded with a press release of its own (see equiery.com), in which it stated that it was pleased to see that the Vet Board was “backpedaling” on its earlier position. Here at The Equiery, we wanted to know what Ms. Clemens’ personal position was. And so we asked her. Equiery: The Vet Board has now gone on the record as saying that it never asked you, specifically, to cease and desist your equine massage practice, and that it really has no problem with your equine massage practice. According to the Vet Board, it does not now, nor has it ever found you in violation of the Vet Practice act. Does this change your plans at all for the lawsuit? The memo makes no mention of exceptions to the statement, such as massage for “general relaxation” or for making an animal “feel better.” If that was the Vet Board’s view at the time, it should have been included in that memo. So no, the Vet Board’s recent statement backpedaling from their earlier position does not change our plans to proceed with the lawsuit against both the Vet Board and Chiropractic Board (which issued the “cease and desist” order). The Vet Board claims that it has “never interfered” with my equine massage practice. Their earlier statement is unequivocal- massage and other manual techniques are considered to be the practice of veterinary medicine. No exceptions. It is a document that the Chiropractic Board used as justification to shut down my animal massage business. That is pretty clear interference. There are no exemptions in the veterinary practice act for licensed massage therapists or for massage and other manual techniques performed by nonveterinarians. Yet there remain exemptions in the act for more invasive procedures, such as equine dentistry, farriery, acupuncture and livestock management techniques. Licensed massage therapists are not being treated equally under the law. There is no guarantee that the Vet Board’s current stated position will be the same one they hold a year from now. And the Chiropractic Board, which relied on the Vet Board’s earlier statements to shut me down, hasn’t backed down from its position at all. So until the law is changed, I, along with other licensed massage therapists in Maryland, will remain under threat of losing our businesses. David Butts is a certified equine dental technician, owner of the Libertytown-based equine dental practice The Horse’s Mouth, and vice president of the International Association of Equine Dentists. The plaintiff’s position against the Vet Board is very legitimate from a working member of society’s viewpoint-particularly when that member is educated, certified and licensed. It is my opinion that vet boards across America are less interested in the welfare of our animals and their owners than they are in their own bankrolls. The [American Association of Equine Practitioners, the American Veterinary Medical Association, the American Bar Association and the American Medical Association] are professional unions: They educate their members, but their major concern seems to be the economic welfare of their members, not the health of the animals/ people their members treat. Yes, it’s costly to go to vet school. But these folks are supposed to care about our horses and their health. They are not supposed to monopolize that care for economic reasons. Most vets admit that their vet school education included barely one to three hours of time spent on horse dental matters. I doubt any vet would take his children to the family doctor to have dental care. So why, then, would a vet believe he or she is more qualified to work on horse’s teeth than an educated and certified equine dentist? The same can be said for an equine massage therapist or anyone educated, certified or licensed in a particular aspect of horse health care. With fewer vet school graduates interested in working on horses, the current equine practitioner is already stretched thin. This situation will only worsen as the horse population continues to grow. Other individuals who are educated, certified and licensed in their horse health specialties will be needed to maintain horse health and free up vets to do the things only they have been trained to do, such as reproductive work, surgery, etc. The bottom line should be how a team of properly educated and certified individuals can best maintain the health of our horses, not greediness over the money spent on horse health care. The Maryland Veterinary Practice Law needs to be changed.